Artisan Foods is a South Florida catering company offering on-site and off-premise catering company specializing in gourmet cuisine and Kosher foods. 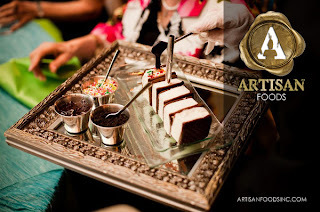 From wedding catering to mitzvahs to corporate catering, Artisan Foods has earned an excellent reputation throughout the Broward, Dade and Palm Beach counties. They combine the finest and freshest ingredients with the most flexible service and staff of professional chefs, bartenders and servers. Their innovative menus and amazing décor transform catering events into inspirational and life-long memories. The diversity of Artisan Foods’ menus is what sets them apart from other catering companies. Artisan Foods will work with you to customize the perfect menu to accommodate your palate and budget. Their hors d'oeuvres and appetizers are one of a kind and their exquisite desserts add the final touch to a perfect evening. Clients may have specific dietary or religious needs to consider. These include Halal, Kosher, Vegetarian, Vegan and food allergy requests. Artisan Foods excels in making sure that the client’s specific needs are deliciously met. A complete bar menu is also available. You can upgrade your event with aged wines, innovative cocktail selections and premium drinks which will be happily prepared for you by their friendly and attentive bar staff. Beautifully prepared food alone can appeal to all the senses, but decorations and ambiance play a significant part in a successfully catered event. Many events require working with an entire theme or color scheme. Artisan’s event planning staff arranges not only food preparation but also decorations, such as table settings and lighting. Artisan Foods prides itself in the presentation of their food and making it attractive within a chosen theme. From Miami to the Palm Beaches, Artisan Foods provides the finest catering in South Florida, offering on-premise and off-site catering. 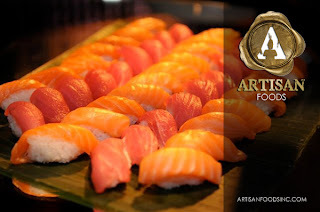 You can contact Artisan Foods by visiting www.artisanfoodsinc.com or emailing info@artisanfoodsinc.com.